Address Plaque with 3 Offset Numbers - - holds three bold 3" or 4" high dimensional characters. Suitable for an address number with digits, such as 512 Seashore Drive. Horizontal or vertical orientation. Made in USA. Our newest ultra chic address plaque is a high-quality, modern sign without the wait usually associated with a personalized product. 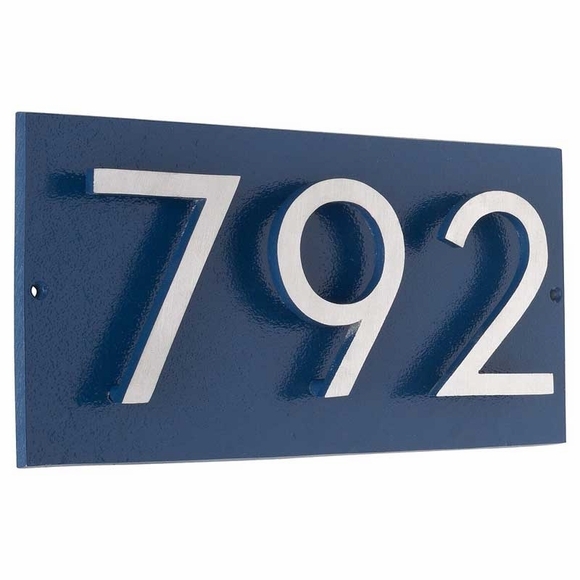 Features raised floating solid cast aluminum numbers on a 1/4" thick solid aluminum backplate with either a horizontal orientation or vertical orientation. with 3" numbers: 4.5"H x 9.375"W x 1" thick. with 4" numbers: 6"H x 12.5"W x 1" thick. with 3" numbers: 10.875"H X 3.375"W X 1" thick. with 4" numbers: 14.5"H x 4.5"W x 1 thick. Address Plaque with 3 Offset Numbers holds three 3" or 4" high dimensional characters. Made in USA. Our newest ultra chic address plaque is a high quality, high style custom sign at an incredibly low price.